Metal complex dyes are premetalised dyes that show great affinity towards protein fibres. In this dye one or two dye molecules are coordinated with a metal ion. The dye molecule is typically a monoazo structure containing additional groups such as hydroxyl, carboxyl or amino, which are capable of forming a strong co-ordination complexes with transition metal ions such as chromium, cobalt, nickel and copper. 1:1 metal complex dyes: In 1:1 metal complex dyes one metal ion is complexed with one dye molecule. 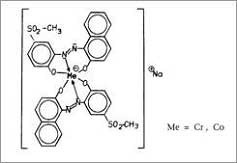 1:2 metal complex dyes: In 1:2 metal complex dyes there are two dye molecules which are complexed with one metal atom. Shows very good level dyeing and penetration characteristics. Can cover up for the irregularities in the substrates. Metal Complex Dyes is using for a variety of applications like wood stains, leather finishing, stationery printing inks, inks, coloring for metals, plastic etc. As this dye is classified into two categories and both have different applications.